Today, the Oceti Sakowin Youth put out an appeal for immediate help, asking people to come to North Dakota to help block construction of the Dakota Access Pipeline as construction nears the Missouri River. 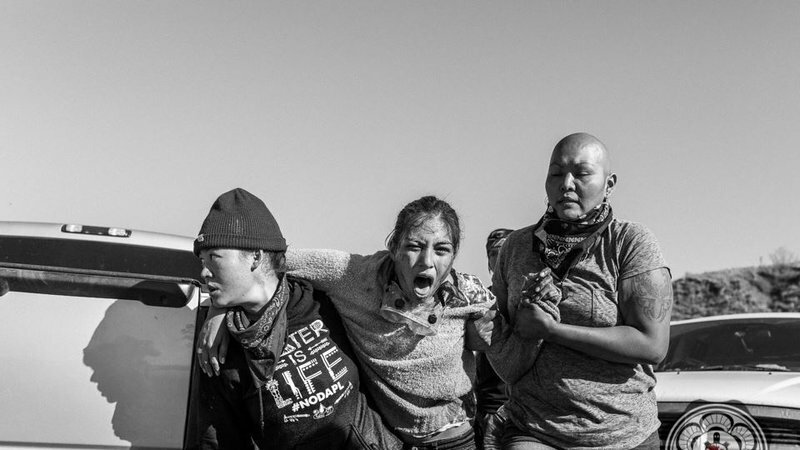 Meanwhile, legal observers are reporting that law enforcement is stepping up its intimidation tactics and civil rights violations against the Water Protectors near Standing Rock. On Thursday, the North Dakota Capitol was put on lock down and clergy and others were arrested in response to a DAPL protest. Nov 5, 2016 — Pipeline construction is less than ¼ mile away from the river, and we are doing everything we can do stop it – including putting our bodies on the line. Just look at the above photo, where Jasilea is choking after being maced by police forces. Friends, we need you at camp now. Please, if you are at all able, fill out this form to tell camp organizers that you are coming: http://bit.ly/2f2Dh5J. We will be back to let you know about more days of action, but in the meantime please come to camp. The time is now. And then there is this story posted yesterday by Censored News, headlined: RED OWL LEGAL: Standing Rock Cars Ransacked, Sacred Items Destroyed By Police. (The Red Owl Collective is a group providing pro bono legal services to those at the camps.) The story reported that more than 60 cars were impounded after mass arrests, then cars were forced open and searched. The story also notes that 17 clergy from various faiths were arrested Thursday at the North Dakota Governor’s Office for trespass and disorderly conduct while praying. About a hundred anti-Dakota Access Pipeline protesters and clergy held a prayer rally on the lawn of the North Dakota state Capitol in Bismark on Thursday evening, ending in a police-ordered lockdown of the Capitol and more than a dozen arrests. Highway Patrol Lt. Tom Iverson said 14 people were arrested in the Capitol’s judicial wing for refusing to leave the building. Iverson said the protesters, who were holding a sit-in and singing prayer hymns, faced disorderly conduct charges.